SKS is pleased to present sample size containers. Sampling your product is one of the best ways to get the attention of prospective clients. All of the containers in this index are under 2 oz in size. These containers come in either metal, plastic or glass, in a variety of colors and sizes. Our containers are extremely versatile and could be used to hold a wide array of products. We carry a large selection of closure options for all of our containers. 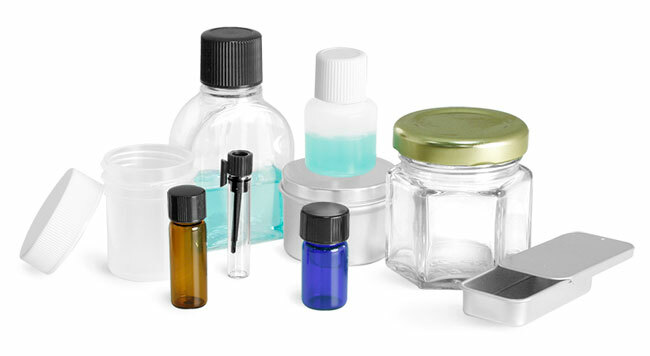 Our metal sample size containers could be great for packaging smaller quantities of products such as balms, salves, bath salts and much more. Eye-catching and durable, these containers add extra style to your product. Add a label and a shrink band to your container of choice and you now have a great product ready for the store shelves! Plastic sample size containers could be used for a variety of products. All of our plastic sample size containers are under 2 oz in size. Our plastic containers could be an economical and sophisticated solution to your packaging needs. SKS offers glass sample size containers that are ideal for many types of packaging needs. These containers are both versatile and attractive to the eye. With container and cap combination options, you are sure to find everything that suits your needs!